The Democratic Republic of Congo is one of the African countries with amazing attractions! Ranging from the endangered mountain gorillas to Eastern lowland gorillas, DR Congo has a lot to offer! This less known travel destination protects unique wildlife various including the Okapis, different bird species, and rich biodiversity areas that include forests, mountains and rivers. With all the above attractions, you have a plate full of activities for you to undertake while on your D.R Congo safari. Below are some of the things you might choose to do while in the country. This is an active volcano which stands at an average height of 10,000 feet; it is the largest lava lake of recent history. It is a must visit for the adventurous people. The 3 days hike of mount Nyiragongo is a tough walk but so rewarding. The ascent is at least 5 hours and the more you go up the steeper it becomes, so tiresome. But when you reach the top, the view of the boiling crater will make you forget the tough hike you went through. It’s just amazing; you will have a really great memorable and interesting experience. It might rain anytime, but if you get lucky and it doesn’t rain it’s much better to have a clear view of the crater, the fog will keep going up and down changing the panorama continuously as the day goes by. But when it gets totally dark that the sky above the crater really becomes red, you will see the real beauty of the boiling crater. It will be one of the most amazing sights you will ever see. As you ascend and descend the mountain, you will see some primates like monkeys, various bird species and some wild animals. This is a bucket list item for most visitors to East Africa. 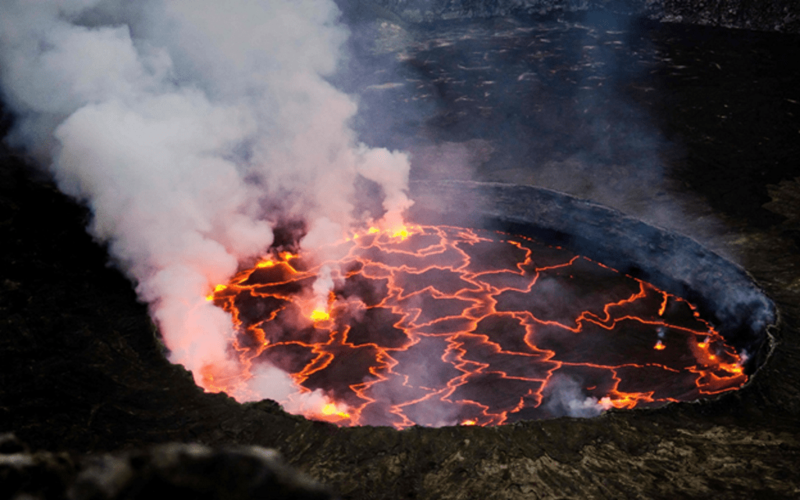 The Democratic Republic has a thriving population of the endangered mountains within the Virunga Region of Eastern DR Congo. Would you like to see these great apes in the wild? Why not book a gorilla safari to Congo and enjoy a thrilling expedition into the Virunga National Park. Take a morning hike into the forest and search for the endangered gorillas. The 4 or more hours trek through the forest ends with amazing close encounters with gentle giants – the mountain gorillas. You will be given an hour to interact with the gorillas, look at then, take photos and videos. Lowland gorilla trekking is done in Kahuzi Biega National Park, the only place where travelers can see the Grauer’s gorillas in their natural home. The park is located near Bukavu town, and lies near the western bank of Lake Kivu and the Rwandan border. It can be accessed from Rwanda and it is a great addition to your safari in Nyungwe Forest National Park. Apart from visiting the mountain gorillas in Uganda, Rwanda and D.R Congo, you should as well add this park to your list if you really love gorillas to also see the largest specie of gorillas (Grauer’s gorillas). This park is located in Orientale province in the D.R Congo. This place is the last holdout for the largest population of elephants and the only surviving population of the Kordofan giraffe in all of Congo. This park is the best place to do a game drive because it presents you with a lot of wildlife which includes the rare white rhinoceros, buffalos, hippos and giraffes. Visit Lola Ya Bonobo sanctuary, which is an excellent project that provides a home for orphaned bonobos. About 60 bonobos live in this sanctuary that is situated on 30 hectares of land. The project has tried to rescue some young bonobos that have lost their families as a result of poaching and also some which are sold out in the black market as pets. So, a visit to the sanctuary will enable you see the endangered species of these primates. The above 5 places are the best places to see the endangered mountain gorillas.